For the Design Tat class here are a couple of doilies created from pictures. The first is called Elephant Flake because this attempt at a snowflake came out in huge proportions. It's 10 inches from point to point and big enough to be called a doily, but it's really too open. The second one looked good on the drawing board but failed in execution. The flower shapes are apparent t the points only because the open chains take nothing away from them. Of course the open chains lack the structure to allow it to hold it's shape and the method of tatting withe chains in the middle of the flowers worked but it was a sloppy way of achieving the design. Which is why it's not been blocked or drawn because I consider it a failed design. Okay, the second one looks floppy, but I really like the first one. 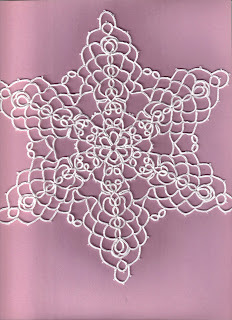 I think it works as a doily, but then -- I like open doilies. Please tell me that you have put them away for a rainy day, waiting for inspiration that will transform these ducklings into beautiful swans. Swans, I definitely see swans. Sharon...I love the first one and I would love to have the oportunity to make it using color threads and put it beside the white one. Send me an email if you think that would be a cool thing to do. I have all kinds of Lizbeth thread here just waiting to be tatted into something. I also really like the second one too that you are calling floppy. I think it is pretty. That is my opinion and I am sticking to it...LOL. I ♥ your elephant flake! I really do and I hope you keep it! It looks lovely as a small doily! I am not kidding! I would tat it up! The floppy flake has potential. 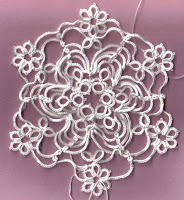 I like the first doily very much, it does not seam too open to me.